I have to admit that this sketch stumped me for a while - but I love what I ended up with. I find it challenging to use patterned paper and still create a CAS card. I used Memory Box patterned paper and Ripe Avocado paper from PaperTrey. I used Scarlet Jewel ink and SU! Old Olive marker on the Penny Black stamp and stamped it onto cream card stock. I sponged some Scarlet Jewel ink to tone down the cream color. Hmmm... Did I miss this sketch? I love the card and the sketch looks easy enough to case. I love your sketches because they are quick and easy for those times when I am short on time. Thanks for a great blog! Ohhh I love this one!!! I just finished up a scrap layout so I may tackle this one tonight too! 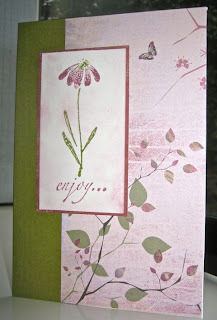 Your patterned paper is gorgeous and really compliments the stamped image and colors you chose.